This is a landlocked, mountainous state in the western portion of the United States. The Native Indians associated with this region include the Nez Pierce and Coeur d’Alene people in the northern section and the Bannock tribe, along with the Northern and Western Shoshone tribes were in southern Idaho. Lewis and Clark expedition for the United States crossed Idaho on their way across the west. That was the first time those of European heritage were in the area. Fur trading posts were established in 1809 and numerous ones added over the decades. The region was part of the Oregon Territory and partially claimed by Great Britain and the United States in the early 1800s. The U. S. gained complete control in 1846. By July 4, 1863, it was made the Idaho Territory which included Montana and parts of Wyoming. Religious missionaries helped establish many new industries to the region. It was Rev. Henry Spalding in 1836, who established irrigation systems, schools, a mission and starting growing potatoes. With the potato famine of the 1840s and 1850 in Ireland, many Irish immigrates came to Idaho to start new lives. Permanent towns came in 1860 and the town of Lewistown was established in 1861. Looking at Idaho genealogy, the important period of new settlers from the eastern states arriving was the 1860s. They were coming for the mining, agricultural lands and timber-lands. Idaho became a state on July 3, 1890. From Spain and northern France many native Basque individuals came to be ranchers in Idaho. The largest community of those with Basque heritage is in Boise. Many Mormon families from Utah came in the 1860s to settle in Idaho, most in southeastern section. Working the railroads in the west, the Chinese laborers eventually settled in the Idaho area and made up about 33 percent of Idaho’s population in the 1880s. The population for the state in 1890 was 88,500 residents. By 1910, a tremulous influx of people had come to Idaho increasing the population to 325,500. In 1980 the state’s population was 943,900 and in 2009 it is 1.5 million residents. 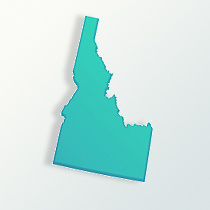 Idaho has primarily a Western European heritage with people of German, English, Irish, Swedish and Norwegian cultural backgrounds. Native Indians make up 2.14 percent of the population with those originally from the Asian continent representing 1.36 percent. African-Americans are only .65 percent of Idaho’s population. The people have worked at industries involving food processing, lumber, wood products, machinery, chemical products, paper products, electronics manufacturing, silver mining, and tourism. The world’s largest factory for barrel cheese is located in Idaho.